The Stop & Shop strike is continuing into its sixth day on Tuesday, marking almost a week since 31,000 employees in three states began to picket. 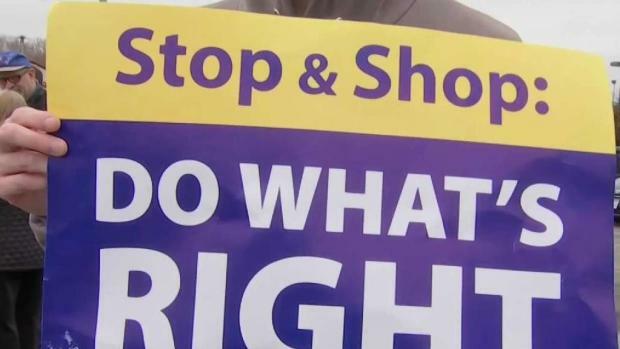 It is unclear when Stop & Shop and the union representing employees will come to an agreement to end their strike, but workers have already expressed concerns over the continuation of the protest. The Stop & Shop strike is continuing with a sixth day Tuesday, marking nearly a week since 31,000 employees in Massachusetts, Connecticut and Rhode Island began to picket. The president of Stop & Shop sent a letter to customers apologizing for the inconvenience the strike is causing. "First, we want you to know, Stop & Shop recognizes the valuable role our associates play in creating a great experience for you," said Mark McGowan, president of the company's New England division. "They are a part of your lives, a part of our community, and key to our success. That's why it is so important to us to provide a fair contract to our employees who are members of the UFCW unions currently on strike." There is no clear end in sight in the Stop & Shop strike since the company and union have yet to come to an agreement on pensions, wages and benefits. He said most stories are still open seven days a week, from 8 a.m. to 8 p.m., but some have reduced services. They said bakery, customer service, deli and seafood counters will not be operational, and they currently have a limited meat selection. Its gas stations are also closed at this time. 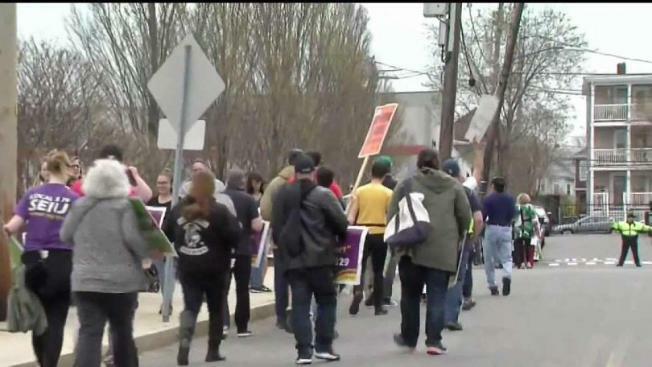 Stop & Shop employees from about 200 New England locations walked off the job Thursday, saying they are fighting for living wages, pensions and better health care. "We're all willing to stand here as long as it takes until we get a fair deal," employee Kristen Johnson told NBC10 Boston. The strike started after the union and company failed to come to an agreement, stalling negotiations. "They're losing people. And they'll be lucky to get some of them back after it," said Dan Deveau, who has worked for Stop & Shop for 14 years. "They're really gambling here." Politicians have chimed in on the strike, with U.S. Sen. Ed Markey joining striking workers in Quincy and Massachusetts Sen. Elizabeth Warren joining workers in Somerville. New Jersey Sen. Cory Booker said he stands in solidarity with the employees. "While Stop & Shop continues to propose drastically cutting worker benefits, shareholders voted on April 10 to give themselves an 11.1 percent raise in dividends over the last year," the United Food & Commercial Workers union said in an emailed statement.